So yes, when you come home from a foreign country, you want to cook all the things you ate there–to see if you can recreate the magic–but then you also want to cook something familiar: the kind of food you missed when you were abroad. The very first thing that I made when I came back from Barcelona was a tomato salad. 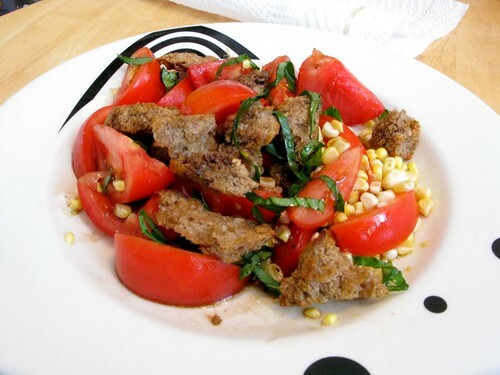 Sure, there were tomatoes there in BCN, but I wasn’t looking for a tomato rubbed on toasted bread with garlic and oil; I wanted big chunks of tomato with basil, olive oil, All American corn, and (here’s the doozy) big pieces of toasted bread. I bought all my ingredients from the Union Square Farmer’s Market, which I visited bright and early the Friday after we got back, still jet-lagged and able to awake at 6 AM. This was just the thing I was craving: and the star of the show was the bread, a rye, which was recommended for this very purpose by the bread sellers there at the market. I cut off the crust, cut it into chunks, tossed with olive oil, salt and pepper and toasted in a 400 oven until it was crispy on the outside. When it came out of the oven, I tossed it with bright, red summer tomatoes (not Heirloom, New Jersey reds: I was saving money) cut into wedges, corn cut straight off the cob, basil, olive oil, red wine vinegar, salt and pepper. Perfection. Wasn’t that a great post? And didn’t it make you want to try grits? 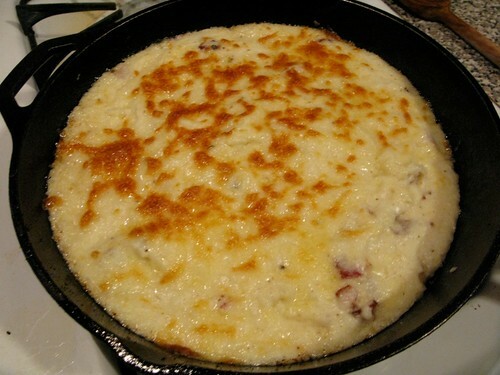 I’d never made grits before–though I’d eaten watery ones at many a Sunday brunch–but Matt’s post inspired me to flip open my Lee Bros. book where I happened upon a more decadent version of the grits Matt made: this one had big chunks of bacon in it. The technique is basically the same, except you cook bacon lardons in a skillet and add the bacon and the fat to the grits instead of the butter. It is VERY healthy. And a very comforting taste of America, in all its fat, fat, fatty glory. This is America’s answer to the frittata (or torta, as many of you corrected) I ate on my last night in Spain: the one with chorizo and aioli. This is America’s version of a fat-bomb. And I liked it just as much, I really did. 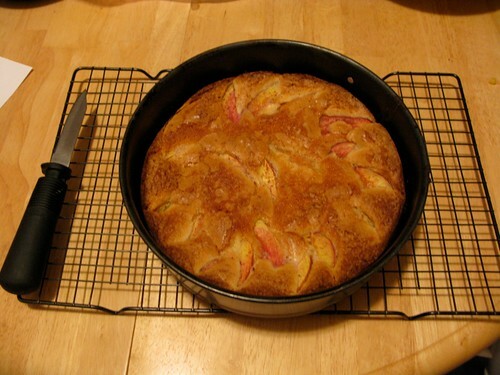 Finally, a truly comforting welcome-home cake is the Nectarine Golden Cake from this month’s Gourmet Magazine (the one with the perplexing cover (it’s a quince (a fruit that starts with “Q” as referenced in “White Men Can’t Jump”))). The recipe is so simple, I can type it up easily here. 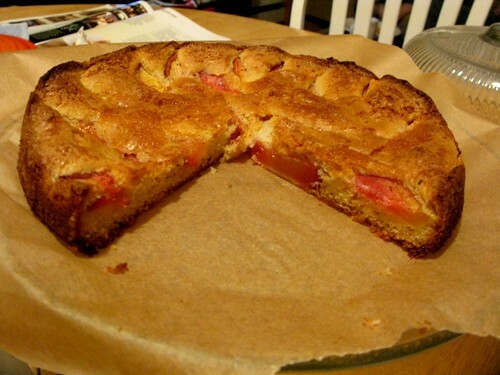 It’s a cake that celebrates summer, makes your house smell good and keeps things simple. Just the kind of cake you want to eat after a long journey away. 1. Preheat the oven to 350 F with rack in middle. Lightly butter springform pan. 3. Beat butter and 3/4 cup sugar with an electric mixer until pale and fluffy. Add eggs 1 at a time, beating well after each addition, then beat in extracts. At low speed, mix in flour mixture until just combined. 4. 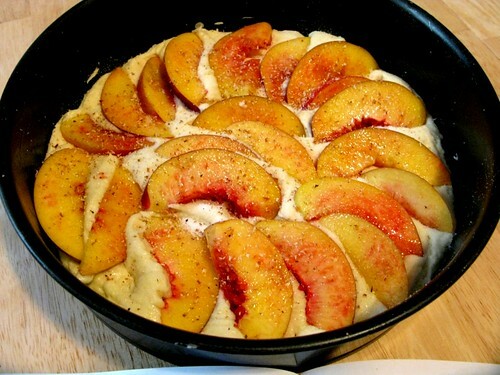 Spread batter evenly in pan, then scatter nectarines over top. Stir together nutmeg and remaining 1/2 Tbsp sugar and sprinkle over top. Bake until cake is golden-brown and top is firm but tender when lightly touched (cake will rise over fruit), 45 to 50 minutes. Cool in pan 10 minutes. Remove side of pan and cool to warm.